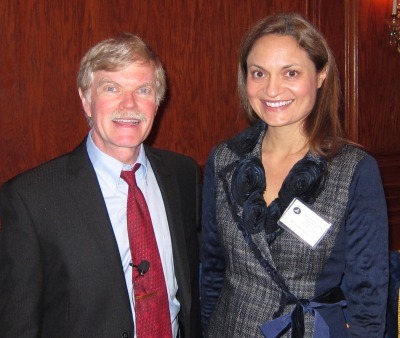 On November 9, 2012, fifty-five dentists and two dental hygienists gathered at Maggiano’s Little Italy in Oak Brook, IL to listen to Mark Cannon, DDS, MS lecture on “Update in Minimally Invasive Pediatric Dentistry.” Dr. Cannon is a guest lecturer at many dental schools in the United States and Brazil as well as lecturing to various groups and associations around the world. Attendees received an outstanding review of the scientific research that goes into placing composite restorations: washing the etched dentin surface with a 2% chlorhexidine solution to eliminate MMPs to preserve the dentin hybrid layer and optimize the bond, performing pulpotomies on primary teeth utilizing NaOCl as opposed to formocresol, a pulp capping technique utilizing TheraCal vs MTA, and the importance of probiotic therapy in a dental practice. The “open sandwich” restoration technique utilizing a RMGI, adhesive and flowable composite was discussed. Dr. Cannon substantiated many of the topics with research that he is personally involved in. His research publications are as numerous as his patents. The attendees were impressed by the depth of knowledge Dr. Cannon bestowed upon them. The CAGD would like to thank our six sponsors for this seminar: Bisco, SS White, GC America, PNC Bank, Hiossen Implants, and TAMSCO-USA . This was the second CAGD seminar of the 2012-2013 season. Again, a big thank you to Ausrine Schneider, DDS for planning this successful event. We look forward to seeing you at the 20th Annual Ted Weclew Memorial Lecture at the American Dental Association Auditorium – 211 E. Chicago Ave., Chicago, IL. on Wednesday February 20, 2013. Illinois AGD will have Dr. Bill Blatchford lecturing on “21 Easy to Follow Steps to Success in the New Economy”. We wish all a happy and healthy holiday season! The AGD Foundation hosted a silent auction at the Leadership Conference. 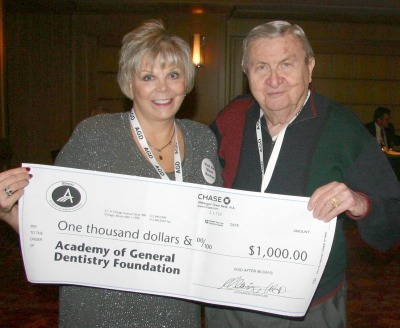 The AGD Foundation was established in 1972 to improve the oral health of the public and support the efforts of general dentists and the AGD. The Illinois AGD recently donated $1000 to help support the many programs that the Foundation supports. Dr. Paula Jones is currently President of the AGD Foundation. Illinois AGD had one of the largest contingents to this conference. Dr. Susan Bishop, our Region 8 Trustee, was a speaker at one of the sessions. Our caucus informally headed by yours truly, included at least three of our UIC dental students, one of whom, Ben Youel, is a national officer of the American Student Dental Association. Our caucus included veteran leaders as well as new leaders and prospective leaders. On the Friday night IAGD hosted our caucus for dinner at Smith & Wolensky, at nearby Marina Towers. This dinner was also attended by the national president of the American Student Dental Association. The informal nature of our dinner allowed us all to get to know each other better in an unstructured environment. Thousands of dental professionals will tune up their continuing education (CE) in Music City during the Academy of General Dentistry (AGD) 2013 Annual Meeting & Exhibits, June 27 to 30, 2013, at the brand-new Music City Center in Nashville, Tenn. The event will offer more than year’s worth of continuing education (CE), as a global faculty of dental experts presents lecture and participation courses on the hottest topics of the day. One of the highlights of this year’s educational program will be the opening session, “Death’s Acres: Life as a Forensic Anthropologist,” with keynote speaker William Bass III, PhD. A world-renowned forensic anthropologist, Dr. Bass is the founder of the Forensic Anthropology Center at the University of Tennessee, Knoxville, also known as The Body Farm, and co-author of the best-selling Body Farm mystery novels. Annual meeting attendees also will have the chance to check out the latest innovations in dentistry at the exhibit hall and connect with colleagues at special networking events. On Saturday evening, the AGD will honor its new Fellows, Masters, and Lifelong Learning and Service Recognition recipients with the Presidential Concert: A Night at the Ryman Auditorium. Sponsored by the AGD Foundation, this intimate evening at the historic Nashville venue will feature a special musical guest, who will be announced this spring. Proceeds will benefit the Interfaith Dental Clinic, a nonprofit that delivers comprehensive dental care to low-income individuals in middle Tennessee. Those who register for the AGD 2013 Annual Meeting & Exhibits by April 26, 2013, will receive early bird rates.